We drive a small motorhome – a Class B (van size) camper. Pictured here, our 1990 Roadtrek offers everything we need in an RV in a very compact space. "Sweet Surrender" after the John Denver song. If you like the idea of the frugal adventure RV lifestyle that I describe on this site and you’re looking for an RV that best fits the bill to take you to the places I’m suggesting, then I recommend you look for a small motorhome. If you're like some of our friends, you may be asking how we can live in such a small space. The answer is, "We don't. We cook our meals in the RV and sleep in it but, unless it's raining, the great outdoors is our living room and dining room." Small motorhomes have become the fastest growing segment of the RV industry in recent years and with the recent hike in fuel prices this trend is bound to continue. Increasingly popular, lightweight RVs that are towed - such as small trailers and tent trailers provide the cheapest option of all. Some can even be towed behind a small fuel-efficient car and are possibly the most frugal option of all. Many people, including good friends of ours, pull a mid-size trailer and are able to access many of the same camping areas we do. However, the overall length, when combined with a tow-vehicle, will prevent you from exploring many of the roads we take in our small motorhome. The solution, of course, is to un-hitch the trailer and explore the road by car or truck before bringing the trailer in. The many advantages of driving a small motorhome can be broken into 2 categories: frugal (or cost saving) advantages and adventure advantages. Can access narrow forest roads and other dirt roads leading to free dispersed camping areas. Can “sneak-a-sleep” wherever overnight parking is allowed. 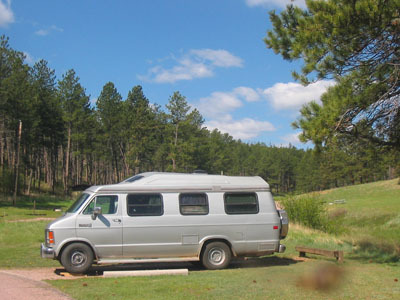 With a larger RV, many people leave the RV behind and drive a tow vehicle to explore the area. With a small RV, your home and food is always with you so you can save on restaurant meals. If, while exploring, you find a great overnight spot, you can stay without having to backtrack to get your RV. Can be used as a primary or secondary vehicle when not traveling. With the recent escalation in fuel prices, a small RV should hold its value better than a larger model. Easy to drive and park. Allows you to explore what's down a narrow road without fearing that you may not be able to turn around. If you find a great spot, your home is with you so you are free to spend as much time as you like. You can be more spontaneous. Since all your gear is with you, if you find a wonderful hiking trail, camping area, or meet up with people, you can take advantage of opportunities without having to return to home base. With less indoor space in a small motorhome, you're likely to spend more time outdoors which, after all, is the idea, isn't it? Practicality - size does matter! With less storage, you'll end up making more practical decisions (and keeping your RV more tidy). For example: one thing that larger trailers and motorhomes have that a smaller RV may not offer is automatic drop-down levelers. We solve our leveling issues with Lynx Levelers. We started off using wooden boards but these levelers are more practical, yet economical. They do the job better, they come with a handy travel case that takes up less precious storage space, they're lightweight, and easy to grab and move around. Trust me, with a smaller rig, there will be more of that - keeping everything where it belongs is the biggest secret to making a smaller space work. Most trucks have higher clearance and perhaps even 4-wheel-drive and will allow access to rougher roads and more areas than any other small motorhome. You may already own a truck and the financial outlay for the camper to add to it is much less than for a motorized RV. If you already own a truck, additional savings include not having to insure or pay for annual license fees on another motor vehicle. Some truck campers are made to fold down to a lower profile resulting in better fuel efficiency. When not traveling, you can remove the camper and have use of the truck as a primary or secondary vehicle. You can upgrade to a newer truck, if you like, but still keep the camper and just transfer it to the new truck. When you are in the camper you don’t have access to the driver’s seat to drive away without going outdoors first...could be a safety and inclement weather issue. A truck camper is higher than a class-B or class-C RV so getting in and out of the camper will mean climbing more steps. When not traveling, it can be a primary or secondary vehicle with seating for 4 to 6 people. No wasted space - on most models the driver and passenger seats turn around to become part of your living space while camping. In an emergency, you can get to the drivers seat from within the camper very easily and drive away from trouble. Most are built more aerodynamically so they get better gas mileage than either a truck with camper or a class-C.
Can be parked in any regular parking space that will accommodate a van or extended van. Easily becomes a second vehicle when not traveling. Some models look more like a conversion van than an RV. Very compact space. Not much storage. The ceiling height and the bed may not be suitable for tall people. Sleeps fewer people than a Class C or truck camper. The bed generally has to be taken down in order to seat more than two for dinner. Usually more expensive to buy than a Class C.
Most have a more spacious living area than either truck camper or class-B. More space means more storage space. Slide-outs for additional space are available on some models. No wasted space - the driver and passenger seats become part of your living space when camping. Not very aerodynamic, so poor fuel economy. Always looks like an RV and generally more bulky so, when not traveling, is not as suitable as a primary or secondary vehicle. This page describes small motorhomes only but you'll find an excellent description of the differences between all types of motorhomes at RV Living Unlimited. If you're not ready to buy, there are few affordable rental options but there is finally one that I've found: Lost Campers is based out of San Franciso, California. Although their vans don't have all the amenities (water, toilet, extra battery power, etc.) of a motorhome, they are an affordable way to experiment with the boondocking lifestyle, especially when combined with free campsites throughout the southwest. When you're ready to buy, look for the best used RV you can afford - especially if this is your first RV purchase. You'll find out, as you use it, what your likes and dislikes are so buying new is not an option until you've spent some time on the road. A new RV can also be very expensive and will depreciate faster than most other vehicles would. Check the used RV ads to see for yourself; whereas, a used RV will depreciate much more slowly. Being Frugal Means Getting The Best Value For Your Money! The type of small motorhome you end up with may be determined as much by what is available in your price range as any decision you make based on preference. Any of the RV types described above will work fine. We've owned two Class B campers (Roadtreks) since we started traveling nine years ago. Both were purchased because we found them at a reasonable price. The only thing we would change, given the option, would be to have a higher clearance 4-wheel drive vehicle. That could expand our horizons even farther. Although some Class B and C campers now offer these features, they are generally quite expensive. For this reason, when we're ready to shop for our next small motorhome, we may find ourselves looking seriously at a truck camper. I guess we should try that change soon, while we're still in our fifties and still able to manage those extra steps.